This long time attraction is located in the San Bernardino mountains off Highway 18 in the quaint town of SKYFOREST, CA. A real must see how Bill Johnson and family have brought the old Santa’s Village back to life by updating and breathing life back into it with many of the outbuildings remodeled, yards and yards of cement poured for the charming paths that scroll through the village. In the winter months the roller rink is transformed into an ice skating rink, there are miles of mountain bike paths. During December Santa and Mrs. Clause are on hand for photos. Enjoy a Christmas experience unlike any other as SkyPark at Santa’s Village lights up through the night. Join us for another Nostalgic Christmas in the Woods inside Santa’s Village! Visit Santa and his friends in the Northwoods, a Village with fun attractions for all! Visit Santa in his home and touch the icy North Pole. As an added bonus, you can join Santa for a whole hearted breakfast party and join Mrs. Claus for a special tea party! Don’t miss exciting Entertainment, such as puppet shows, tree lightings, and interactive storytelling throughout the Park with the Northwoods Characters. Santa’s Elves will be holding special crafting workshops and cookie decorating classes for those who want to craft their own creations. There is lots of fun to have at Santa’s Village and many exciting attractions. You won’t want to miss any of it! Santa’s House & North Pole is where it all begins at Santa’s Village. Visit the Jolly One in his own home. Silver Bells Arena Start a new Christmas tradition skating on our charming, outdoor pond. Entertainment Whacko the Magician, Skypark Puppet Theatre, Kid’s Imagine Nation, Storytelling and tons more. Special Holiday Experiences Breakfast with Santa, Tea with Mrs. Claus, Cookie Decorating and Crafting with Santa’s Elves. Santa’s Workshop & Post Office See what Santa and his Elves are up to and mail your very own letter to Santa. Northwoods Characters include Arrow, Celwyn Claus, Wilbur Weatherforce and many more. Northwoods Express Train Ride is a charming and fascinating ride and tour of the Village. The Santa’s Village Mining Co. Help Santa find his missing “good luck” gold coin. Snow Quest Join Princess Evergreen in her Quest to find the magical snow crystals. Arrow’s Adventure and Magic Portal Zoom through the ice cave and prepare to enter the world beyond. Fantasy Forest Experience This interactive night walk through the Northwoods is a unique and immersive experience for Guests of all ages. Village of Lights Enjoy a Christmas experience unlike any other as SkyPark at Santa’s Village lights up through the night. It is a short parade (a mere 2-4 blocks in length) but just perfect for families and their little ones to enjoy. The parade marches down Main Street and with the help of HB Police PD it crosses over Pacific Coast Highway to Pier Plaza and the Huntington Beach Pier for the annual Pier Lighting, Meet Santa and youth entertainment. 12/10 Annual Fireman’s Bonfire 5:30-10pm DATE CHANGED! It’s finally here! The Great Pacific Airshow returns this weekend to Huntington Beach and will run 11:30am-4:30pm Friday, Saturday and Sunday, Oct. 19 – 21. For anyone new to the area or to anyone visiting our City this weekend, the jet noise will be LOUD. Loud jet noise is anticipated toward the end of the show each day. The Thunderbird team will participate in a practice flight taking place Thursday, Oct. 18 from 1pm – 2pm. Remember this is a NO DRONE ZONE. Temporary Flight Restrictions are in place beginning tomorrow and continue throughout the weekend. 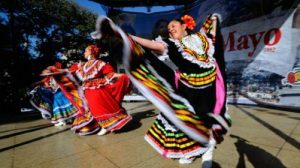 The City welcomes you to come and enjoy this patriotic, family-friendly show. If you have any questions about where to go, what to bring, how to purchase tickets, or the schedule of events, visit www.pacificairshow.com. Have a fun, safe weekend and See you there! 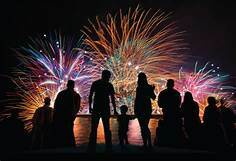 7/4 ALA Fireworks Spectacular on The Lake! Click here for details! 9/3 Labor Day Weekend! Concerts Friday, Saturday, Sunday evenings and Monday afternoon! Come one, Come all to the Lake Arrowhead Concert Series 2018. There will be Food, Drinks and of course “The Music”. Free lawn chair seating is available on the grass and in standing areas/dance floor only. Easter is right around the corner and that means the Easter bunny is going to arrive at The Lake Arrowhead Village. 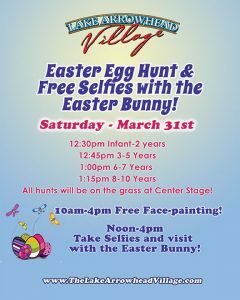 Come one, come all on Saturday, March 31 for The Lake Arrowhead Village Easter egg hunt. The but begins at 12:30pm till 4pm & take selfie’s with the Easter bunny from 12pm-4pm. 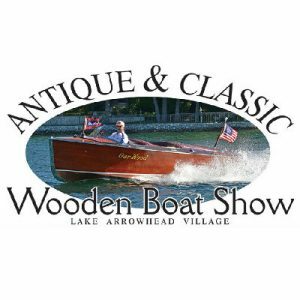 For more details go to The Lake Arrowhead Village web site. Join us for St. Paddy’s Day in the Village! GOLD HUNT & ENTERTAINMENT: 4-6pm Kids’ Leprechaun Gold Hunt (ages 10 and under)–search for gold in the Village and trade them in for Face Painting! Irish & Traditional Folk music by award-winning group, The Storywrens, on Center Stage. 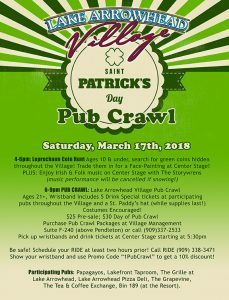 PUB CRAWL: 6-9pm Pub Crawl in the Village! Purchase your presale tickets for $25 today! Or $30 the day of near Center Stage. Gets one free drink special at participating pubs throughout the Village! Pick up your Drink Tickets and St. Pat Hat (while supplies last) from 5:30pm on March 17th! Papagayos, Lakefront Taproom, The Grill at Lake Arrowhead, Lake Arrowhead Pizza Deli, The Grapevine, Tea & Coffee Exchange (non-alc), Bin189 (at the resort). Call RIDE for a safe trip home! Get 10% off of your RIDE by showing your wristband or using promo code “1PubCrawl”. Reservations are recommended at least 2 hours in advance…call 909-338-3471 or use the RIDE CALI app on your smart phone! Call 909-337-2533 M-F 9-5 and reserve your Pub Crawl package!